Picked up this SE in IL right outside of Chicago. 95k miles and only two owners. The interior is beautiful she drives great so really the only issue is some body rust from sitting in a snow drift last winter. I plan on keeping it stock and clean as possible with my own personal touches. Anything I should check or change right away other than the usual? Almost everything works this is the obvious list of what's not working I haven't had time to really check her out. Last year in May the brakes were redone including the master cylinder and fresh tires put on other than that and normal oil changes I'm not sure what else has been done I'm waiting to receive the maintenance records. Speedo probably needs a new cable if it's like my 85. Changing the at to manual? It probably does I'm just going to get a new cable and not fuss with the old one any good place to order from or just go direct Nissan? I don't plan on it unless I can buy all the manual conversion parts in one bundle or the AT gives me an issue. Rock Auto carries a surprising amount of stuff for our cars, may have the speedo cable. The cruise will not work if one or both of the little rubber pads are missing at the pedal switches (brake and clutch) Check for these as they make contact with the switches and no contact, no cruise. I have made due with a ty-rap making up for a missing button, but you can still get them from Nissan if you want. Later down the road if you want to get more performance, look up Ian's (Iceager) write ups on mods/hybrids on the VG engines. Parking in the winter won't help him in Florida. The salt is in the air. All he can do is keep the paint in good condition and stay away from the beach. As for the VG33 hybrid, if you are going to pull the motor and you have any intention of dismantling it partially . . . in my mind there is no way to justify NOT doing the VG33 hybrid conversion. Effort to benefit there are only a handful of easier swaps in modern-ish automotive history. That interior is amazing. My interior is in decent shape but it is blue. After 10+ years of looking at blue interior I have learned to accept it but have always been envious of the guys that got the black interior. Best interior color for any car hands down. I had a two week break off tour and I barely got to work on the SE anyway I got to put it on a lift and check everything flushed the radiator, two oil changes (1k miles apart), changed fuel filter and left front brake line. An hour into driving my temp gauge likes to creep up just below the danger zone ( / ) depending on the weather. I'm gonna tear it down and install a new radiator, water pump, thermostat, timing belt, and I'm thinking of mounting two small intercoolers for oil & trans under the condenser. I'm still spooked about changing the atf even though it shifts okay. The atf is medium red and clean but it smells I would like to change it but I don't want to cause issues. I got the speedometer cable working and it spins okay but It's not even close on MPH the odometer is counting mileage though. I'm gonna replace the cable but I'm not sure if my dash is messed up there is an '87 4cyl Auto at a yard near me so could I use the dash & cable out of it? Damn that looks super clean! Cleaaaaan! Where in Florida are you? Please tell me that you need cash really bad! haha. Well an update to this thread I had the SE apart for over a week giving it some love and kicking the tires when it wouldn't start haha. The headlight/taillight warning light still won't go off even though every light works and even more strange the fuel injector wires both positive & negative have power ALL the time even with the key off but function like normal?! Now I'm still chasing the cooling issue that's driving me insane... The way It's acting definitely leads me to believe the radiator or the block is clogged full of sludge BUT the fluid flow is strong and water comes out clear as it goes in so I'm scratching my head. Punched out the thermostat so It's getting max flow, checked the fan shroud and even tried some maxima fans wired to run all the time on either medium or high switch controlled. It will drive for 10 mins warming up then 20 mins about halfway on the temp gauge and after that it will just keep heating up until you let it cool down or blast the heat. After some research I really don't want to flush diluted acid through it so I might order some "four seasons super flush" It's salt based and was recommended by a few people as well as straight vinegar. I'm weighing my options between more flushing or just buying a nice shiny S13 rad to see if that fixes the issue. My SE has the same cooling issue, it never actually boiled over, but according to the gauge it was running hot all the time. This was after having the radiator professionally cleaned out and running dual electric fans from a Stanza. I'm restoring it now, and one of the things I'll check is the temperature sending unit. You might want to do the same. I'm away from my car right now but I'm gonna have a few days to work on it before driving to Atlanta hopefully in the SE. The temp gauge has always been right but I'll check the CHTS maybe just replace it to be safe and mine has boiled over while trying to narrow down the cooling issue but it cools down at idle after awhile. I've read up on everything you did to yours and I've done some of the same. I haven't had the rad cleaned/rodded yet nor have I tried flushing it with chemicals at home so that's next. 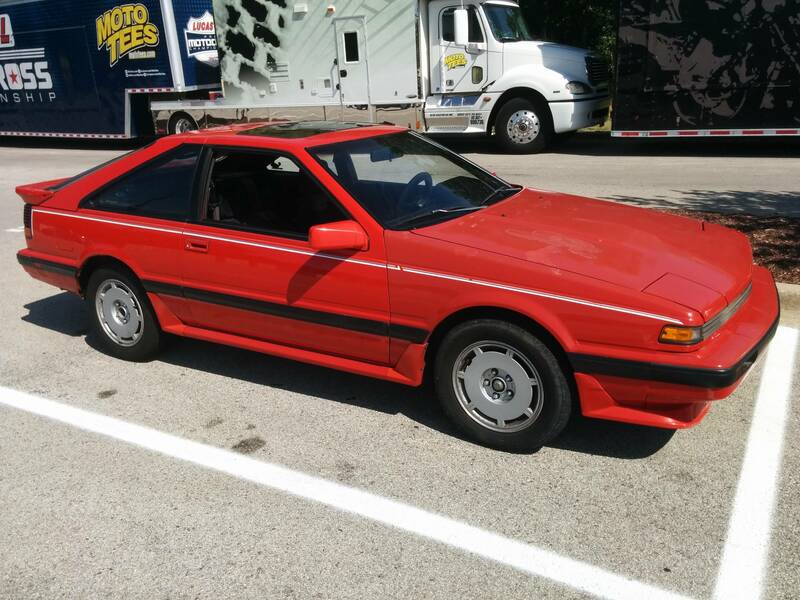 Edit: Well I just noticed I now own this SE http://jalopnik.com/for-4-000-this-1988-nissan-200sx-looks-factory-fresh-1720248686 but I got it from some 19yo who also owned a turbo 240 and was letting the SE rust away.